Today, my little boy — who is not so little any more — graduates from elementary school. Nine years in the making. I still remember dropping him off at his first day of the wonderfully titled “preschool disabled” program at another elementary school in town. It was the day after his third birthday. We were terrified. We could not imagine leaving this child, who struggled so much to communicate his needs, in the care of strangers. But as we all fought off tears, Ryan was quickly wrapped in the loving embrace of an unbelievable teacher who would guide him through his first two years of the program. The aides and therapists could not have been more caring. It was obvious — these people would not just teach our son, they would love him. It was still incredibly difficult to leave our crying child with them that day, but we knew he was in good hands. Fast forward nearly a decade and one school later, and today Ryan will graduate from fifth grade. For each of those nine years, he has been taught, and guided, and embraced, and aided, through the school system by some incredibly caring, warm individuals. He has been loved. And we have never worried about leaving him in their care. In so many ways, Ryan barely resembles the scared child we dropped off so many years ago. He’s nearly as tall as his mother. He has developed socially and intellectually in so many ways. He has friends. He plays sports. He is able to communicate his needs. And though there are still plenty of struggles, and plenty of worries, today is a day to stop and reflect at how far he has come, thanks to his own hard work and the efforts of so many of the individuals that have assisted him along the way. Teachers, aides, therapists. The school secretary who promised on his first day to look out for him and has never failed to greet him with a hug. They have all played a part in getting him to this point. Ryan’s yearbook came home last week, full of signatures from friends wishing him a good summer. As soon as we could, we flipped through it to find his picture. 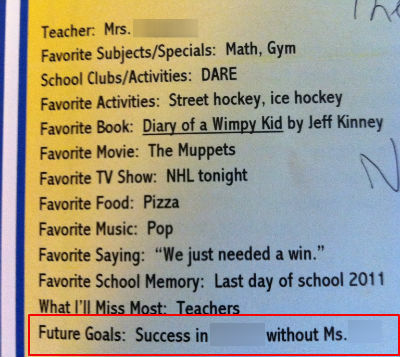 Each child had a chance to list their favorite things, as well as “future goals.” Before reading, I would have bet anything that his future goals would have included either “playing in the NHL” or “being a hockey talker (announcer)”. Ryan rarely talks about the future, but when he does he always lists one or the other as his future occupation. Veronica was reading his entry out loud; favorite activities, book, movie, etc. When she got to future goals, her voice caught and she stopped in her tracks. On about the third attempt, she finally got the words out. Like a lot of parents of children on the autism spectrum, Veronica and I try not to look too far ahead. It’s not easy. You see your child struggle and you wonder what this will look like at age 15, 18, 35. It’s a dangerous game. We try to remind each other to focus on the here and now and the immediate future. What can he do this week, this month, this year that he couldn’t do a week/month/year ago. Small victories add up and it helps you feel like the long-term progression will be positive. And yet, we wish Ryan wouldn’t follow that same advice. 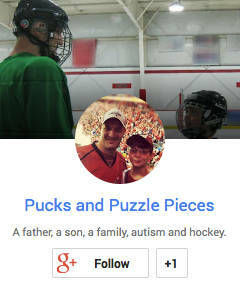 We wish he’d listed playing for the San Jose Sharks as his future goal. Ryan’s yearbook entry. In case you were wondering, his favorite saying comes from Florida Panthers’ backup goalie Scott Clemmensen. He is so worried about changing schools. About not having his familiar aide. About riding the bus. So are we, but the last thing we want to do is have Ryan pick up on our fears. The unstructured summer is always trying. This year’s will be more of challenge, as we fear Ryan’s anxiety over his new school will creep in and prevent him from having any summer fun. We are doing everything we can to make the transition easier. We’ll visit the new school and new teachers over the summer. We’ve already made fast friends with the administrators. They’ll be hearing from us plenty. It’s funny. You spend so much time worrying about how your child will develop. And then they do, and they’re ready to take the next step, and you worry even more about that. We never wanted to take him to elementary school as a three-year old. Now that he’s ready to move on, we don’t want him to leave. Ryan is ready for this. The transition will be rough for a brief period. But he will adapt, and so will we. He will succeed, even without his aide. Now that I’ve dried my eyes….I wanted to say that this post touched my heart–thank you for sharing. I believe Ryan is going to achieve much success in middle school. Look how far he has progressed…friends, interests, self-awareness, team sports, math skills, etc. With the strong support system at home (and school), I see him mastering his goal for his future! P.S. I love reading about older children on the spectrum and their successes and progress…gives me so much hope. Thank you for that, too. Constant worry. . . good luck, Ryan! You go Ryan! Hang in there mom and dad… hang in there.